Ace Aerobatic School is operated by flight instructor Catherine Cavagnaro who holds Airline Transport Pilot, CFI-I and designated pilot examiner (DPE) certificates. She is also a Professor of Mathematics at the University of the South and chaired the Department of Mathematics and Computer Science. Catherine has served as a spin demonstration pilot at the University of Tennessee Space Institute (UTSI) as well as on research and flight testing teams for the aircraft icing project using the UTSI variable-stability Navion. In 2018, Catherine was recognized as the Safety Representative of the Year by the Federal Aviation Administration. It is the highest such award bestowed on those working in the general aviation community. She is also a member of the Tennessee Aviation Hall of Fame (2018 Class) with an enshrinement date of 3 November, 2018. In April 2018, Catherine received the Award for Excellence in Teaching at Sewanee: The University of the South. 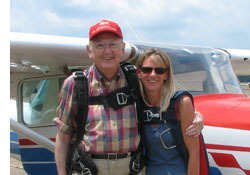 Catherine taught with Bill Kershner for the last few years of his life and maintains his legacy at KUOS in her 1979 Cessna Aerobat “Wilbur.” You can see his matching 1979 Aerobat “Orville” at the National Air and Space Museum (Udvar-Hazy Center) in Washington DC.